On July 5th, 2014 the Moon and Mars presented a great pairing in the night sky and I took this opportunity to get the telescope out and take a look. 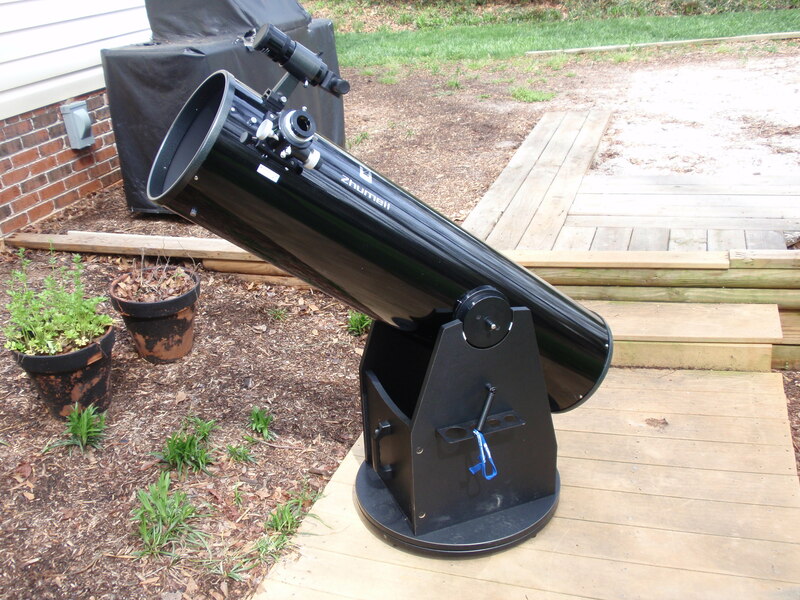 I have a 10” Newtonian Reflector telescope on a manual Dobsonian mount (pictured below) so taking good quality pictures with this telescope is difficult because the scope doesn’t have a mount that tracks with the rotation of the Earth. 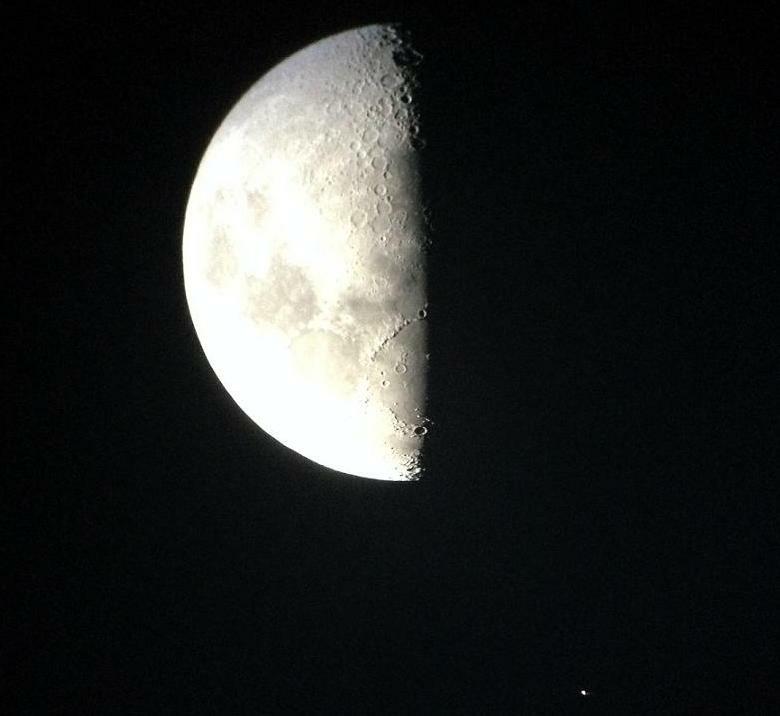 But tonight I got lucky and snapped this picture of the Moon and Mars. I also took advantage of some good atmospheric seeing to view Saturn and I could not only see the Cassini division in its rings but also a slight shadow of the planet on the rings. It was a great observation session but tonight proved once again how important it is for amateur astronomers to view the cosmos from their front yard vs. their back yard. One of the many pleasures I get from being an amateur astronomer is sharing my knowledge of the cosmos with others and when I have my telescope set up in the front yard I invariably get questions by people out walking. This happened tonight and a gentleman, who was walking his dog, jokingly asked me if my telescope was some sort of apparatus for shooting fireworks! I invited him into my yard and pointed out that I was looking at planets tonight. He asked me what that star was next to the moon and I happily told him it was no star but Mars. I also pointed out that the bright ‘star’ far to the left of Mars was actually Saturn. He pointed to the star immediately to the left of Mars and asked if that was it but I told him no, that was the star Spica and he had to look a little more left to find Saturn. We had a nice conversation, introduced ourselves and I gave him the opportunity to peer into a telescope for the first time to see, with his own eyes, the rings of Saturn. For those who are amateur astronomers do not be monk-like with the knowledge you have but instead be evangelists to help your neighbors discover the beauty of the cosmos! Addendum – For those interested, I used a Televue Nagler 11mm eyepiece with a Televue 2X Big Barlow and an iPhone 5 held with my steady hand to capture the above image of the Moon and Mars.